It's embarrassing for a film critic to admit but I can't recall the first movie I ever saw in a movie theatre. And while the first movie I remember walking out of was Disney's Fantasia which creeped out my brother, friends and myself to no end, one of my earliest memories of a movie watched regularly in my circle was this film about an altogether different Fantasia. In fact, Wolfgang Petersen's first English language effort, The NeverEnding Story became one the never-ending movies of my childhood, which suburbanites in the '80s saw regularly at slumber parties and in school, when E.T. (my personal favorite) or The Princess Bride (one I've grown to love more as an adult) were unavailable. And when the film landed back in my life over two decades later from Warner Brothers, the memory of the young bullied grade school daydreamer Bastian (played by Barret Oliver) flying through the skies on the back of the dog-like furry luckdragon Falkor came flooding back. Is there anything more empowering to children than the wish that you could soar through the skies and control your fate? It's no wonder that this scene is reminiscent of another '80s classic involving Elliott and E.T. flying by the moon on the boy's bicycle to the music of John Williams that never fails to land in my mindscape whenever Spielberg's tale is mentioned as well. And of the three fantasy works from my childhood, unfortunately neither one of these titles has aged quite as well as The Princess Bride, perhaps because-- introduction with Fred Savage aside-- it never feels like a contemporary fantasy film but a vintage period piece. Of the trio, E.T. fared the worst in terms of just how dated it appears today precisely because the fantasy element was woven into the then-modern landscape. And in this case, NeverEnding Story is a bit more successful than E.T. since it does feel '80s in its bookend Princess Bride read-along set-up and like Blade Runner some of the visuals and musical cues do feel very much of the time period but since the majority of the picture takes place in Fantasia, we're able to lose ourselves in the setting with a bit more ease than I'd worried. Essentially, like Bride, Story is a high quality message movie targeted to young boys that argues that reading can be even more adventurous than playing the most challenging video game. Having lost his mother at a young age and victimized daily by bullies who shove him in a garbage bin if he doesn't have bribe money, Bastian retreats into his mind in ways that anger his father who tells him out of frustration that by now Bastian is of the age where he has to get his head out of the clouds and keep both feet on the ground. Yet, after a typically grim morning with his tyrannical classmates on the way to school, Bastian ducks into an eccentric bookseller's shop where the proprietor tells the avid reader that even though he owns more than 180 books, when he finishes those, he always goes right back to life as a safe little boy. Using the old ploy of “look but don't touch” in teasing the child with a book he says doesn't operate by those rules since it isn't safe, Bastian later borrows the “dangerous” tome without permission, only to discover that he's getting literally lost into the story of a young boy who has to save an Empress and their land from doom. 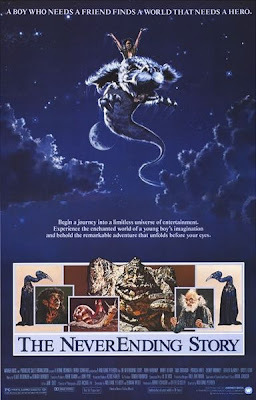 Filled with adventure, creatures that seem pretty weak in the realm of CGI but made this the most expensive feature of its time, NeverEnding Story shares that reading allows you to become anyone you're following in the plot as we watch Bastian mentally and then literally journey with them through the fast-paced quest. An influential children's classic to which you can still find homage today, Wolfgang Petersen's film that took some major liberties with Michael Ende's original source material proved to be a thrilling place to visit once again after all these years, although I'm not sure how effective it will be with today's tech savvy youths who find their lectures and textbooks have been replaced by power point presentations and books becoming more and more scarce without using a device that flips computerized pages for them. Released on high definition for the first time, the picture seems a bit dark overall and soft around the edges in the contrast but the sound in the first ever utilization of lossless 5.1 surround sound in the history of the movie really makes the speakers in your home theatre come to life even if the visuals are a bit on the dull, colorless side. Without any extra features aside from the enhanced stunner of an audio track, you'd probably be safe to stay in DVD as inevitably there will probably be a grander re-release of the film if the rumored remake that's allegedly intended to be truer to the book gets off the ground within the next few years. Peterson's film arrived on Blu-ray on the exact same day as the Warner Brothers release of 1981's Clash of the Titans. And while Titans struggled far more in retaining a convincing visual display for the stop-motion animation and NeverEnding will necessitate you play with the color balance levels a bit, it's a worthwhile experience to go back and revisit the smash successes of the early '80s. And despite their flaws and perhaps the less than necessary need to upgrade to high definition, it's fascinating to look back on the pair from not just a storytelling point-of-view but also to contemplate once again the movies that helped teach my generation that it's okay to dream... and read.